I finally understand the importance of having the right car insurance. But this only happened after making numerous mistakes. I have loved cars for as long as I can remember. As a kid they were my first choice of toys; and as a teenager, I spent many hours trying to (unsuccessfully) convince my father to let me drive his car. So, once I got a job, my first dream purchase was, obviously, a car. After a lengthy, and exciting, buying process, I was thrilled to get the keys to my car, even if it was second hand. I then realised that I had already stretched my budget and was in no mood to spend money on insurance; something I perceived as an unnecessary expense. To reduce my premium, I renewed the existing car insurance policy; but instead of the original comprehensive cover, I opted for a third party cover, thinking it was the smartest move I made. It was one of my biggest mistakes. I met with an accident only a few weeks later, and while I escaped relatively unhurt, my car was not that lucky. Not opting for a complete cover left a huge dent in my pocket, as I had to foot all the bills myself. So, if you are buying a car, here are some mistakes you should avoid as far as possible. There are two types of car insurance policy. While one is cheaper and offers minimal coverage, the other costs a bit more, but offers extensive coverage. Third party liability car insurance plan: This kind of insurance covers only the damages, injuries, and death caused to the other party in the event of an accident. However, it does not cover damage caused to your own vehicle, other vehicles or injury to yourself. While this option might seem more appealing, it is important to understand this kind of insurance before buying it. Comprehensive car insurance policy: Along with third party liability, this plan covers damage caused to your car, in case of an accident. It also covers any damage caused by natural calamity, theft, fire, etc. offering more wholesome protection. A good NCB (No Claim Bonus) policy etc. IDV (Insured Declared Value) is the amount you get at the time of a claim in the event of a total loss or theft of your vehicle. This amount is based on your car manufacturer’s listed selling price minus the depreciation. When making a claim, make sure the IDV declared for your car is correct. While a higher IDV means higher premiums, a low IDV (to save premium costs) could result in a financial loss at the time of making a claim. Note: IDV is usually auto-generated by your insurer, but you have the option to increase or decrease it by a certain percentage. Related: What is IDV and Why Insured Declared Value is Important? Often, we fail to read the policy draft before buying insurance. Doing so could leave you ignorant about certain clauses. So, check the document and ensure all the details mentioned are correct. Any errors in your name, phone number, address, and vehicle number could cause major complications later. Ensure these details are correct before buying the plan. Many of us look at add-ons as an extra cost. But there are some that are available at attractive prices that can be extremely helpful in the future. For instance, road-side assistance, towing facilities, hydrostatic cover, engine protector etc. are extras that don’t cost too much, but can provide assistance when you desperately need it. Once you have decided on what plan to buy, find out what is covered and what isn’t. 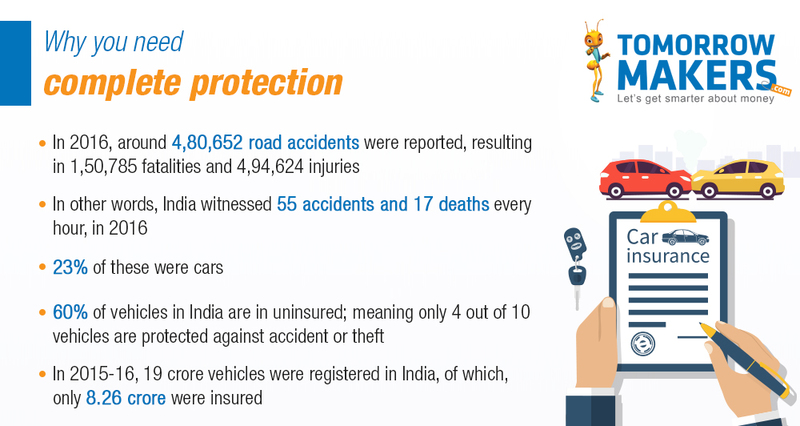 Many people buy insurance blindly, without knowing the benefits and drawbacks. Ask questions before signing the paper, and read the terms and conditions to avoid disappointment later. These simple things can save you a lot of trouble and more money than you can imagine.